Subject: Plate : 'Femme des environs de Salamanque'. 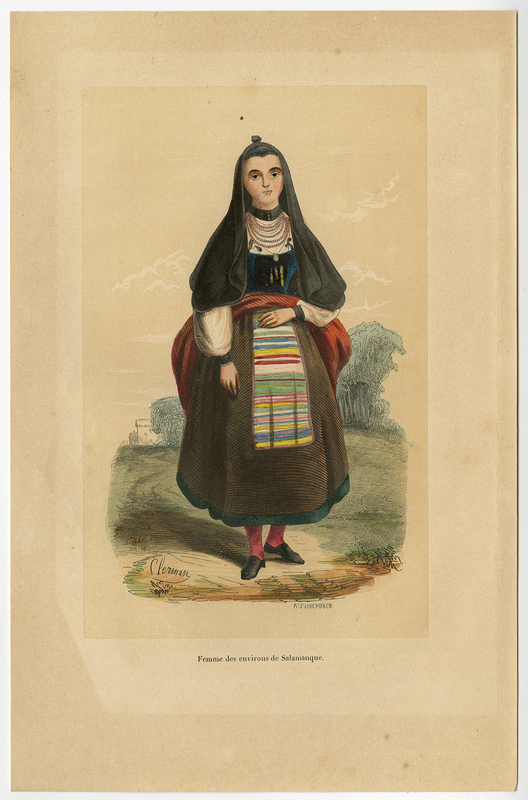 This plate shows a woman from Salamanca, Spain in 19th century costume. Condition: Good, given age. Margins partly browned, will frame out. General age-related toning and/or occasional minor defects from handling. Please study scan carefully. Medium: Tone wood engraving printed from two plates, with beautiful original hand colouring heightened with arabic gum. On wove paper. Size (in cm): The overall size is ca. 17 x 27 cm. The image size is ca. 12 x 19.5 cm. Size (in inch): The overall size is ca. 6.7 x 10.6 inch. The image size is ca. 4.7 x 7.7 inch. Description: Original antique print published ca. 1870. Artists and Engravers: This plate by A. Pannemaker after Clerman.